When Pima County Sheriff Clarence Dupnik ascended the national stage and declared — a mere 8 hours after the horrific shootings in Tucson — that our vitriolic political process was to blame, he was listening to his ragged emotions and a blinding political bias. He was certainly not heeding the evidence of the crime. The alleged gunman’s own actions on that bloody Saturday suggest he was not primarily motivated by some hate-filled ideology or festering grievance against Congresswoman Gabrielle Giffords. Why do I say this? 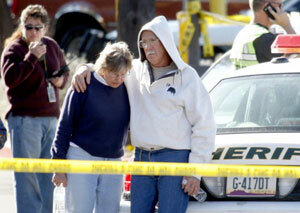 Jared Loughner, the alleged gunman, came armed with at least 3 clips containing over 90 rounds of ammunition. By most accounts, he moved to within feet of Giffords before shooting her in the head. There is no doubt that he intended to kill her. But what did he do next? As Giffords fell, the young man turned his weapon on the crowd of bystanders. He emptied his first 30-round clip, leaving people screaming and bleeding on all sides, then attempted to reload. In that momentary pause, a brave woman stripped the ammunition from his hand and threw it out of reach. As he struggled to load another clip, others leapt from cover and tackled him. In other words, he treated the crowd of innocent bystanders with the same pitiless rage that he had summoned up for Congresswoman Giffords. He aimed to kill everyone, and would certainly have killed many more had he not been stopped by those brave men and women in the crowd. Instead of focusing his rage on Giffords, he spread it around equally in all directions. That is a telling point, I think. Without being too macabre, the killer had more than enough time and firepower to make certain Giffords didn’t survive. Not limiting his rage to her helpless, bleeding body, he turned away and gunned down a nine-year-old girl, elderly men and women — anyone and everyone within his sights. This rage was calculated, methodical, deliberate, and entirely indiscriminate. These are not the actions of someone aggrieved by a political slight or unhappy with an election result. This was a Columbine-style ego-maniacal power trip. Surrounded by carefree human beings immersed in the small miracles of everyday life, he lashed out and tried his best to destroy that miracle wherever he saw it. It’s important that we get this right. There are always opportunistic political forces ready to seize on horrific events to advance their own agendas. The media and others have been quick to take up Sheriff Dupnik’s cri du coeur because it suits their political narratives. It is true that we would be a better nation if we each followed Christ’s example and treated political opponents with love, even while disagreeing with them. Too frequently, debates about ideas devolve into baseless attacks on motives, reputation and character. But the overwhelming evidence in this case is that this young man was not driven by ideology, but by a vast spiritual and moral emptiness. The true source of his rage was the existential meaninglessness of a life cut off from the source of all hope, Jesus Christ, our redeemer and creator. That same spiritual darkness that drove the shooter to wantonly injure and kill so many strangers is also consuming western society. By continuing to live with our backs turned to the God who is our very reason for being, we only invite more such tragedies. Christianity is mankind’s one true hope. The secularization of the western world has left people without an anchor, without purpose, without direction. For most, there are sufficient material and hedonistic diversions to numb the pain of meaninglessness. We’re lost, but as long as our iPods are loaded with great music, who really cares? Greater numbers every day are finding this sucking emptiness intolerable, which is why drug use, suicide, depression, sexual perversion and self-abuse are all on the rise. It is why murderous acts of rage, unthinkable 50 years ago, have become so common today. The choice is just that stark, and just that simple. All that awaits us is more death, more destruction, so long as we try to go it alone by turning our backs on the gospel of love and hope revealed in Jesus Christ. Toning down our political speech will do nothing to heal the emptiness that has consumed so many friends and neighbors. Christians need to set a Christ-like example of love, generosity and humility in our political speech, but the key problem the world faces is not political, but spiritual. We who have experienced Christ’s abundant life must not hoard this good news all for ourselves. Now more than ever, our communities and our nation need to hear from us about the truth that we have discovered, that there is hope, purpose, forgiveness, joy, abundant living — it is freely given to all who kneel before the blood-stained feet of our Lord Jesus Christ. A personal note: Gabrielle Giffords is my Congresswoman. We disagree on many significant issues, which led me to vote for her opponent in the last election. But she is and has been the sort of representative you wish everybody had. She is bright, energetic, articulate, tireless in serving the people of the 8th district and a woman of great integrity. I am praying daily for her full and complete recovery, and ask that you would do so, too. Please also pray for all of those families and friends who have lost loved ones, as well as those who have survived this tragedy wounded both in body and heart. What happened in Tucson, is appalling. Good people coming together in the hope that their participation as a community could solve problems that could help themselves and others. This has no religion or politics, and by the same token, all religions and political persuations. Goodness is goodness whatever name you give it. What we are experiencing here in the USA is but a speck of what’s happening in the world. Haiti, Iraq, Afghanistan, and across the border are the obvious. Let us not forget slavery. We are all guilty in a way, because of historical myopia. We forget that only a few hundred years back we massacred the original inhabitants of our land. Who are we, you may ask? All of us that came to this land with the hope of a better life? Yes. Why did we leave the original land of our forefathers? Because we were persecuted too. When does this stop? Only if, as individuals we come to terms with the truth. We choose to forget and continue our lives as nothing happened. Big mistake. The problem is still there and festering. It takes a lot of courage to recognize that we are not only victims, but also victimizers. Even if we live righteous lives. Living like that is not enough. We all( I include myself) have to want to know the truth. Drop irrational fears as a decision, and start living a life of healthy curiosity, and look for the reasons how we got where we are now. This is a time to do it,wherever we are on this planet, which is really “our home”. Like it or not, as long as we can’t get off it alive, it’s our home. So we better take care of it. Our churches, religions, Spiritual groups are places where honest reflexion should always be encouraged, and with one goal, and that is to take care of everything related to our home, planet Earth,and it starts with us, “human” beings. Practicing the discipline of being well informed by taking the time to hear all sides of an issue, will help us come to that ultimate human gift,and that is compassion. Compassion. Not easy at first, and only done by a conscious decision to practice it will do it. It can be done. This horrendous wake up call we had in Tucson, is an opportunity that all persuasions that believe in love must embrace each other. Be kind, someone told me once. I never forgot that. So simple. Think kind. Give from ones kindness. It’s such a balm to a wounded heart. Loving and compassion will change anything, whatever the obstacle. Lets get to know what other people are going through as far back as we can go. Educate ourselves in being sensitive to others. Acknowledge everyone we meet. We depend on each other. One flash in time such as this horrendous event is very telling of what we humans are capable of. Behind hate there is pain and hurt. Let’s emulate the ones that had the courage to act and stop this disturbed young man in his destructive onslaught. It’s time to do conscious and premeditated acts of loving. For one wrong,do ten acts of good.Loving will prevail if we want it enough. My heart goes out to all the families who were affected by this event. This is the best theological essay I’ve read on this tragic case. I’ve linked it to my Facebook Wall. Thank you for your thoughtful reflection.